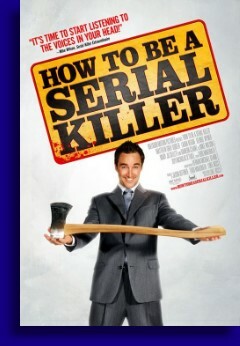 Mike, as deftly played by Dameon Clarke in this movie ‘How to be a Serial Killer’, has a plan to make your life better. Like other self help luminaries such as my main man Carlton Sheets or those cats who relentlessly attempt to sell you stuff like the late pitchman Billy Mays, Mike has a simple ten step program on how to stop being a loser and taking control of your life, and this would be by becoming a serial killer, just like him. Writer / Director Luke Ricci’s film has three distinct parts to it. One part would be Mike, dressed very much like a natty pitchman addressing the audience directly on stage, detailing the outline of his program and how it could work for you. The second part is a mockumentary featuring interviews with characters such as Mike’s girlfriend Abigail (Laura Regan) who is oblivious to Mike’s side job, though I guess one would think she’d be just a little bit curious why people are interviewing her about this boyfriend of hers, and there are also interviews with Mike’s young loser apprentice Bart (Matthew Gray Gubler) who made Mike’s acquaintance while watching some poor guy abuse Bart at the video store where he’s a clerk. As we have observed, if you are a video store clerk in a movie, you are a loser. Not in real life mind you as I’m sure there are plenty of upstanding, ambitious non-losers who work in video stores, but not in the movies. The third part of the story is a regular movie following Mike around, with Bart in tow, as he goes through the process of systematically murdering people while giving Bart instructions on what and what not to do. Don’t pick anybody you know Mike would inform Bart, though Mike does break that rule a couple of times. Don’t kill kids, don’t rob from your victims, and try to only kill those who deserve to die. For Mike that last statement is rather broad and inclusive and could very include almost every body on the planet earth in some form or fashion. However, as life affirming as serial killing may be, it is still against the law in most municipalities and Mike does run into a touch of hot water, mainly by not following his own, clearly stated rules. But it was good while it lasted and the man has lived his life by own set of rules even it does mean sucking a needle in the end. If nothing else, Luke Ricci’s film ‘How to be a Serial Killer’ is unique. Does this mean that it’s a good flick? Hell, that’s a damn good question and took me some time to come to a reasonable conclusion about this. You see this is a film that is so skewed in its approach to telling its story that it takes some thought, at least for me, in forming some kind a coherent opinion of this movies worth, but after thinking about if for a while I’d have to say that ‘How to be a Serial Killer’ is indeed a good movie. There is a lot to like about this movie, starting with Dameon Clarke’s performance as Mike the Serial Killer. Clarke has made Mike charming, violent, and he always seems just one step away from completely snapping. You know that guy… that friend whose crazy but always claims he’s ‘joking’ when you know damn well he’s not ‘joking’? That’s our man Mike and Dameon Clarke plays Mike so well that one has to wonder if he was acting or if he is actually that guy. It’s also a funny movie in a subversive kind of way. Not side splittingly funny, though it does have its moments of comedic inspiration, but the majority of the humor just comes from the absurdity of it all. Watching Mike discuss with Bart why he became a serial killer say, over becoming an astronaut is a fairly insane conversation and there’s a lot of straight laced humor in this movie similar to that. The movie is a bit erratic in the various ways it chooses to tell its story which may make it hard for some to get completely immersed in the story and it does have it slow moments and lulls stashed away throughout its running time… but it is different, and from my vantage point it is good and different which is saying something in this day and age of big budget carbon copies.